The "Congréss National pour la Défense du Peuple" (CNDP - People's National Defence Congress) was founded as a "political movement" on 25 July 2006 in Bwiza, Province of North Kivu. The party statutes (Article 9) clearly the "politico-military struggle' as a means to reach its objectives. The CNDP is the follower of the non-governmental organisation "Synergie Nationale pour la Paix et la Concorde" which was founded in Bukavu on 18 December 2003. Led by the dissident General Laurent Nkunda (b. 1967), a Tutsi, the CNDP was one of the most important insurrection movements in the Kivu region. On 23 January 2008 nine politico-military movements active in the Provinces of North and South Kivu, including the CNDP, signed a "acte d'engagement" (ceasefire) in Goma with the government of the Democratic Republic of Congo. On 27 August 2008 MONUC (the United Nations Mission in the DRC) which is in charge of the demilitarization of Kivu announced that the CNDP was still committing "actions of mistrust against the authority of the state". Among these actions are the use of the flag of the movement in the areas it keeps under its control, the establishment of police and customs forces and the enrollment children as soldiers". Article 5 of the party statute states that the CNDP emblem is made of a blue background with a green disk charged with a red torch held by a hand. This is probably the basis of the flag design used by the CNDP in the areas under its "control". On the party website the flag is shown graphically with a light blue background. The torch is reminiscence of that found on the former flag of Zaire. Mark Jenkins, a map was published on pp. 82-83 as an illustration of the way in which the political and military situation in eastern DRC affects the Virunga National Park, especially the safety of the mountain gorillas (the murder of two groups of these animals in June and July 2007 had given the pretext for the article). On the map, positions of different military and paramilitary forces were marked with their flags. The National Congress for the Defense of the People was represented with a flag very similar to the one shown on the movements website, but the arm was yellow as well as the torch. It is yet to be verified if this is a variant of the flag which is really used or just an error, because no other sources seem to have confirmed it so far. The party's official website, provides more details on the party and its emblem. On some pages of the website, the party is called "Mouvement pour la Libération du Congo", but the party's statutes include only "Mouvement de Libération du Congo". The MLC is the result of the transformation on 05 April 2003 of the former "MLC - Mouvement Politico-Militaire", an armed movement founded on 30 September 1998 to oppose former President Laurent-Désiré Kabila's government and supported by Uganda, into the "MLC- Parti Politique", a political party. The transformation is mentioned in the party's statutes (Art. 1), adopted on 29 January 2006, as well as at the party's official headquarters in Kinshasa (Art. 3), the capital of the country. The militia of the MLC, the Armée de Libération du Congo (ALC) was (or, at least, should have been) transferred, together with ammunition, to the regular army of the Democratic Republic of Congo (Art. 3). Sese Seko), being appointed Vice-President of the country. In 2006, Bemba competed in the Presidential election. His residence was attacked by the Presidential Guard in August 2006 and he lost the second round of the election against the incumbent Joseph Kabila with 42% of the votes. In spring 2007, Bemba's personal guard, which was still not incorporated into the national army, was defeated by the national army. Bemba left the country for Portugal in April 2007 and was arrested in Brussels on 24 May 2008, upon request of the International Criminal Court. Chapter II ("On the ideology, the motto and the emblem") says: Article 9. 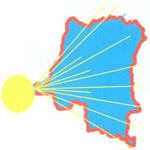 The emblem of the MLC is a yellow "ant" placed in the middle of a blue field of the flag of the Democratic Republic of Congo. Chapter V. Of the emblem, the flag and the motto. Bemba's militias are nicknamed the "fourmis" (ants), hence the prominence of the symbol in the party. From the intermittent series on maps on flags provided by Mason Kaye. This is the flag of UFERI, (L'Union des Fédéralistes et Républicains Indépendants - Union of Independent Federalists and Republicans). Seen on Belgian TV on August, 1992 (hence Zaire - not Dem. Rep. of Congo). Outline image provided - coloured by me. I guess this was seen as a vertical flag. Yellow map of Zaire in center. Disc is red, half circles are blue. Red circular border. White background, blue writing: UFERI - NOTRE ESPOIR (our hope). I was living in Congo when the name and flag of the country changed to Zaire. An MPR flag (the party allowed under the Mobutu regime) already existed. It had the same flag as what became the national flag of Zaire, but without the yellow circle: thus green with an arm holding a torch with a red flame. It remained flag of the party even after the national flag was changed. For as long as it remained a unique party, the cockade worn by its members was that same design : the torch on a green background, on an oval little jewel made of copper. For dignitaries, it was better carved, and protected by transparent plastic. 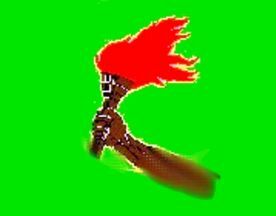 A lot of books, reviews or papers from the Mobutu period also showed this insignia : a green band with the arm and the torch. I cannot imagine where the so called "party flag" designed by Mr Martins according to Mr. Bliss can be found. If that design has something in common with Mobutu and his party, then it could only be related to the period 1965 - 1967 when he founded an organization called CVR (Corps des Volontaire de la Republique = Corps of Republican Volunteers). But the green and torch flag appeared in the same time as the "Manifeste de la N'sele", at the foundation of the MPR party. (N'sele is the name of a village where Mobutu gathered number of politicians to prepare the MPR manifesto). The National Alliance's Party for Unity (Parti de l'Alliance Nationale pour l'Unité) is a centrist political party in the Democratic Republic of the Congo, founded in 2003. It has 190 candidates for the upcoming parliamentary elections in July 2006 and has decided to support President Kabila in the forthcoming presidential elections (see http://en.wikipedia.org/wiki/National_Alliance_Party_for_Unity). "a white flag, bordered with 11 gold stars for the eleven provinces of the country surrounding a red arrow pointing upwards" (rough translation) see it as a shield at http://www.panu-cd.com/. The Parti du peuple pour la reconstruction et la démocratie (PPRD) (Peoples Party for reconstruction and democracy) of President Joseph Kabila uses a yellow flag with the party symbol in the centre. This is a blue map image of the country with two stylized hands in red and yellow clasping each other. The party acronym is found between the wrists and above the symbol on the yellow field. The PPRD was officially registered with the Ministry of the Interior by Decree 031/2002 on 02 April 2002. The statutes of the party should prescribe the emblem of the party in Article 12, but this is left blank ("The emblem of the party shall be...) on the online version of the statutes. The party was founded by supporters of Joseph Kabila and members of his government. It should follow the tracks of Patrice Lumumba, the Prime Minister murdered in 1961, and Laurent-Désiré Kabila, Joseph's father. The political party "Rassemblement congolais pour la Démocratie" (Congolese Union for Democracy) has unveiled its new flag on 23 July 2005 in the party seat, located in the city of Gombe. The flag was presented by Azarias Ruberwa Manywa, national President of the party and Vice-President of the Democratic Republic of Congo in charge of the Policy, Defense and Security Committee. The new flag of RCD is blue with a dove, a palm tree and the lettering "bonne gouvernance" (good governing). - the dove represents peace because " we are campaigning for peace. We fought war for peace, this was the price to pay". "[...] The dove shows that even in a so-called peace time, we have to search for the real peace, that is the inner peace." Moreover the dove shall show that RCD is today a tolerant and no longer a violent party. - the palm tree represents democracy. - the "bonne gouvernance" (good governance) is "a series of rules and practices which give hope to our Republic and our citizens and determination to our youth". "All members of the RCD who act against the "bonne gouvernance" will be sacked. The party was founded on 10 August 2001 and officially registered by Ministerial Decree #130 on 07 April 2005. There were no UNIR-MN representatives among the 33 candidates who competed in the 2006 presidential election. Photographs taken in 2004 during a TV-interview in Brussels, available on the party's website, show the party's President, Frédéric Boyenga Bofala, sitting in front of the party's flag. This flag is vertically divided into "Congo modern" - "Zaire" - "Congo ancien", that is the three components of the party's map emblem (see below) transformed into a flag. The emblem and flag reflects the party's acronym, "UNIR" which means in French "to unite". 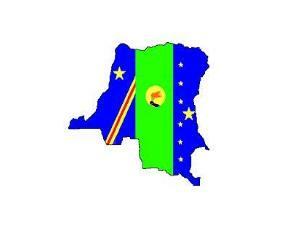 In its statements, the party also uses the name "Congo-Zaire" for the country which is also reflected in its flag. The party flag shows, from left to right and arranged vertically, but with equal yellow and red stripes; the country's current flag, the flag of Zaire, and the second flag of independent Congo. This is a flag of the Union pour la République-Mouvement National (Union for the Republic-National Movement) (UNIR-MN) taken from the party's official website at http://www.unir-mn.org/ It contains the party's map emblem comprising the national flags used by the country in the centre of a white field. My question here is what really is this flag, because is surely not Mobutu’s party flag. Not only it has no resemblance to the Zaire flag, but also it features a map of Zaire / Congo-Kinshasa without the southern secessionist provinces of Katanga/Shaba, Southern Kasai and what seems to be part of Kivu, something Mobutu would never have endorsed. It seems to me that that the map is just a distortion in order to fit the flag (and the outspread hands). The long stretch into Zambia is there, as well as the hiccups in the frontiers between Congo and Zambia. In my opinion it's quite safe to assume that Nathan Bliss' image was a bit distorted and that the real flag had the real map of Congo (or Zaïre) on it in red. Many political flags produced by expatriates have been proved to be geographically (or otherwise) incorrect. Mobutu's party was the Popular Movement of the Revolution (Mouvement Populaire de la Révolution), founded in 1967 as the principle vehicle of the Mobutu regime. It was renamed in 1990 to Popular Movement for Renewal (Mouvement Populaire Renouveau - MPR). Although I can't say for sure that it is related, I have found the logo of the Union pour la Défense de la République (which can be seen above which shares the colours and some of the elements (sun and map) of it. The map is used by many parties but the UDR is the only party, as far as I can tell, that use a sun.